This Notice to Air Men (NOTAM) is a permanent feature to keep you informed about the Stetson Club. Check back often as this information is updated in real-time. 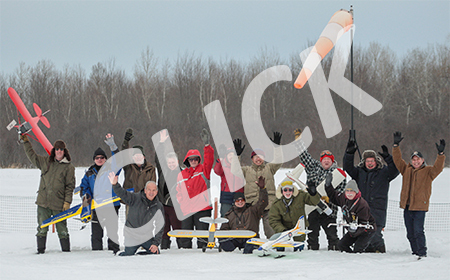 ...the annual Stetson Winter Fun Fly event! The grey skies and the sometimes nippy wind from the east did not stop a dozen pilots and almost as many spectators from thoroughly enjoying a fun morning of flying and socializing. Although this was not the best day for flying white airplanes, Kevin and Les managed quite well, except for a minor mishap with Les' E-Flite Convergence. The most difficult part was the recovery. The snow is still quite deep, and a pair of snowshoes would have helped make the trek to the far side of the runway a bit easier. On the other hand, Gerry did not have any problems with visibility, with his very colourful red, yellow and green machine! Overall, everyone had many pleasant flights. The heated shelter was available to keep people warm, and we all gathered in it at lunchtime to top off the fun fly with an excellent bowl of chili. Several prizes were drawn, including two pairs of fingerless mittens donated by one of the women of the Blackburn Hamlet Community Church 'Knit Café', as well as some Stetson stickers and pins. Hal MacDonald and Nigel Chippindale won the gloves, and Kevin McDougall and Charlie Colwell won the Stetson stickers and pins. Like always, teamwork made this event a success. As usual, thanks to Simon and Hal for bringing their top notch photo equipment out in the cold and taking pictures (Hal's pictures are on the Stetson Facebook page). Many thanks to Daniel and Louise for preparing and serving the lunch. Finally, thanks to Daniel and others who cleared snow around the tables over the past week, making the event safer and more enjoyable. Again, thanks to all who helped and participated - we all had a great time. ...the annual Stetson first flight of the year event! 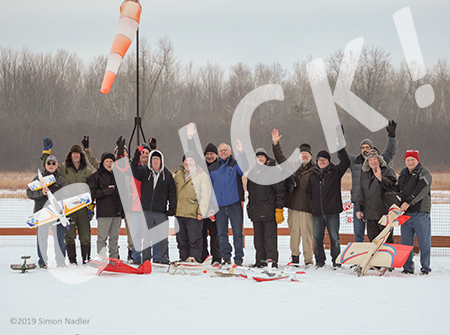 Although it did not occur on New Year's Day due to the risk of unsafe road and field conditions, the 2019 First Flight held on 5 January was a total success. The flying conditions were almost perfect, with above freezing temperatures and very light winds. The day began with hazy and light gray skies, which posed challenges to pilots flying white planes, but this improved considerably as the morning progressed. Sixteen members took part in the event, and after the usual first flight friendly competition and presentations, several people stayed on and enjoyed a very pleasant morning of flying. The honours for first in the air went to Nigel Chippindale in the Electric power category, and to Gary Robertson in the IC engine category. The winners each got a very nice engraved medallion donated by John Jackson, and a pair of fingerless gloves donated by one of the 'knitting ladies' from the Blackburn Hamlet Community Church Knit Café. Many thanks to Simon and Hal for taking photos, and to the executive for organizing the event and preparing the field. Enjoy the pictures. Jon's ultra micro SE5A looks great! 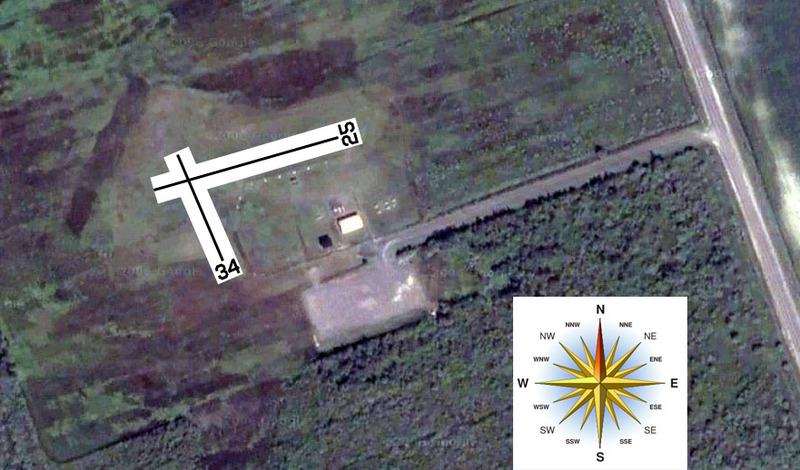 Wednesday April 24, 2019 is the next scheduled meeting at the Aviation Museum. Catch up with club members and let everyone know what you have been upto this winter. Meeting starts at 7:30, come in through the front door.